It’s been so long since I’ve been here! The clouds are breaking. Work has lightened up, at least for now. We have a new staff member, which I hope means that my workload will stay reasonable. Homework is decreasing as the end of the school year gets closer. Whew! I’m convinced that 3rd grade has been harder on me as a parent this year than it was when I was a student myself some 30 plus years ago. I finished my cake decorating class. If grades were given, I would have been lucky to get a C. For the last class project, my cake leveler broke and I was unable to get the nice, smooth surface I wanted. I made cream cheese frosting, which the instructor recommended against. I’m a hardhead. I could not bring myself to put butter cream icing on a red velvet cake, and I didn’t have time to make two frostings. I took my chances. 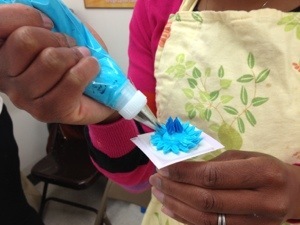 As a result, my frosting was too soft to make the pretty flowers I saw in my head. At least the cake tasted good (or so I was told). You couldn’t tell by looking at the final cake, but I actually learned a lot. I need practice, which means that I need to bake, which I haven’t had time to do. Well, this weekend I will have time as well as a reason to celebrate. Yesterday was the birthday of Albert, Jay’s favorite stuffed puppy. Albert has birthdays every few weeks. Jay decides the theme and plans the party, including the type of cake and how it should be decorated. He gave Albert three birthday gifts yesterday, including a sleeping bag that looked like a sock. So, we’ll top off the celebration with a special cake for Albert. Mae is done with social skills training until the fall while the therapist takes a summer break. I definitely plan to return to the social skills playgroup. I had a nice, long talk with the therapist during our last visit. She talked about helping the kids recognize “unlikeable” behaviors that make it difficult for other kids to stay friends with them. I’m convinced that there is value in structured play time with interventions or corrections as necessary, both in being corrected and seeing others corrected. A teacher told me recently that kids need to see or hear something at least 17 times to master it or make it habitual. So, I’m going with that. The cognitive behavioral therapy is on hold because we couldn’t get a regular slot that worked for our schedules. If Mae asks to go during the summer, it may work out better since we won’t have to worry about homework. This weekend I’ll also be working on travel plans for a vacation in June. Sooo looking forward to that! The vacation, that is, not the planning.